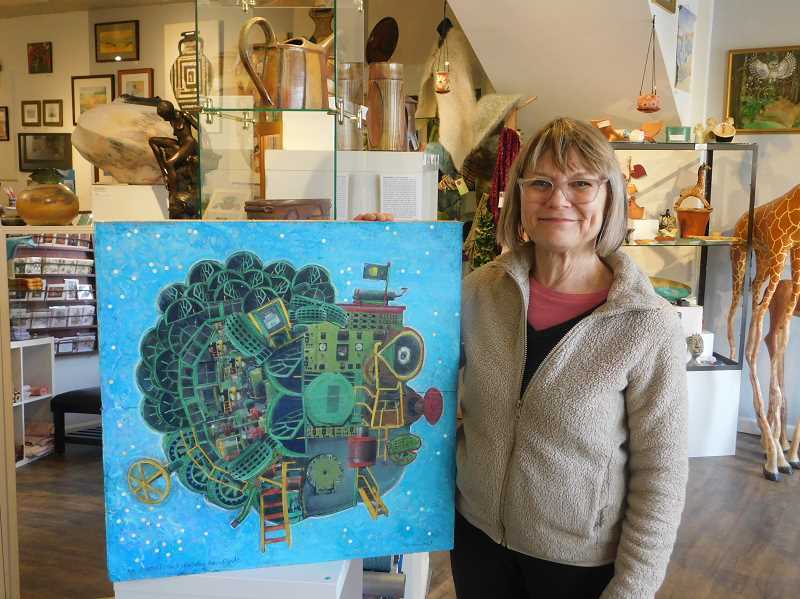 Art depicting industry along the Clackamas River will soon be displayed in the Estacada library. "Clackamas Dams," featuring art created by Nina Bradford during Estacada's Powerhouse Project several years ago, will hang at the library from Monday, April 9, through Monday, July 9. The show is presented by Art in the Library. The Powerhouse Project was a result of collaboration between Portland General Electric and the Estacada Arts Commission. During the project, artists created works inspired by tours of the Clackamas River's powerhouses. Artists toured River Mill Powerhouse in 2010, Oak Grove Hydroelectric Facility in 2011, Faraday Powerhouse in 2012 and North Fork Dam and Powerhouse in 2013. The pieces were initially displayed at the Estacada Library, PGE headquarters in Portland, the Clackamas County Development Services Building and Clackamas Community College. During the project, Bradford created nine paintings and collage pieces, many of which will soon return to the library. Years later, Bradford still recalls how inspirational touring the powerhouses was. "Being in a powerhouse is an incredible experience," she recalled. "You walk in, and the first thing you're aware of is the sound. You can just feel the electricity in the air. It's really visceral. After, you still feel like you're buzzing." The art Bradford created during the project focused on several elements of the powerhouses, such as the rushing water. "I can just imagine the force (of the water)," she said. "It's just a physical experience to visit powerhouses. That was part of my inspiration, and it definitely colored what I did."